Who’s got World Cup fever? Even though the USA got knocked out of the Round of 16, you know what? We are all winners. Happy Independence Day to the greatest nation in the world! I’m so proud to live in America, and not repressive Iran or economically unstable Greece or even England with their monarchical system based on the divine right of kings. – More Americans are watching the World Cup than the Superbowl. – More Americans purchased tickets to the World Cup games than any other country, with the exception of the host country Brazil. My husband and I are clashing when it comes to which countries we are rooting for. His heritage is British and Italian, so he is rooting for all the European countries. I love Central and South America, having traveled to Belize, Costa Rica, Guatemala, Honduras, Nicaragua, Argentina, Bolivia, Brazil, Ecuador, and Peru, so clearly I am rooting for the countries on the Western Hemisphere! The American fans going wild in Brazil when Will Ferrell shows up. I can’t get enough of this hilarious video of Jason Sudeikis as an English soccer coach. And lastly, unless you don’t recognize him up above signing autographs. That’s a picture of the amazing USA goal keeper Tim Howard who plays for Everton. 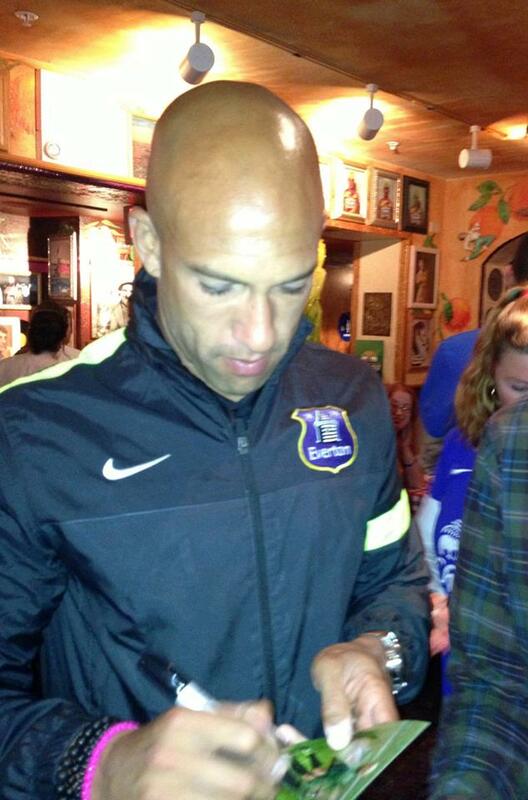 We saw him when Everton came into town and hosted an event for their fans at Buca di Beppo. Dean is a huge fan! I haven’t been watching, but you’re getting me in the spirit! Or is it already over before I even got to experience it? Happy 4th to your beautiful family! We have been glued to the World Cup coverage. Tim Howard was amazing and the US team did their country proud. Not watching. But my husband is catching up on YouTube from time to time. The ambiance is festive! I read Google news about it though. Keep the spirit alive! Yay! I have watched some of the World Cup (due to work) but have been following it on different devices. Watch both the South Korea/Russia game and US/Belgium down at Civic Center. I was rooting for the US and the Socceroos (Australia) but both gave good efforts and are out. Hope you had a good Fourth of July. Tim Howard is amazing! I love watching him in action. We’ve been watching the World Cup although I have missed some of the games. Hope you had a great 4th of July! Love the world cup. Can’t wait to watch those videos. I am so obsessed with the world cup! Tim Howard is a hottie and he played his entire tush off in the US loss!! The Jason Sudekis vid is hilarious! I have never seen it, I have to send it to my husband for sure. Happy (belated) Independence Day to you, too! I love the patriotism that surrounds the World Cup and the “One Nation, One Team” campaign. Angel’s the world cup fan in our family. He was rooting for the Netherlands to win it all, so he was pretty sad when they finally lost this week. Love that video! I am not really rooting for anyone, I just love soccer and all that comes with the world cup!